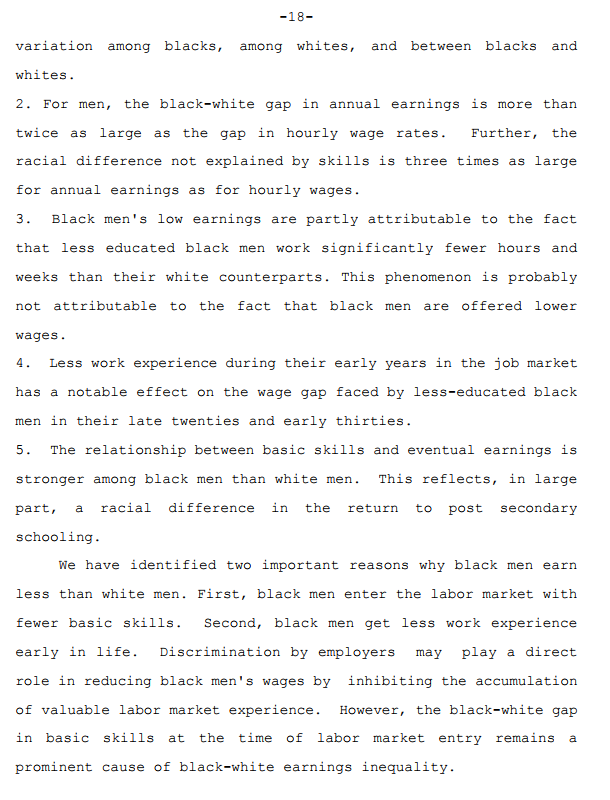 Most studies and articles purporting a ‘wage gap’ between blacks and whites do not control for IQ, skills, hours worked, prior job experience, educational attainment, and employment status. Young white workers work significantly more hours than young blacks with similar skills. The main exception is that young black college graduates work almost as many hours as equally-skilled white college graduates. As a result, they earn almost as much per year. Finally, we show that the disparity in hours worked has a cumulative effect. At all skill levels, the black-white wage gap stems partly from black-white differences in past work experience. 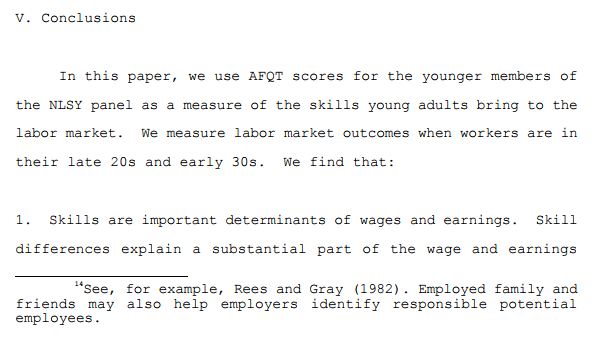 Controlling for AFQT completely changes these residual wage gaps (see columns (2) and (4)). For men, the wage gap narrows by roughly two thirds, to about 9 percent. For women, the gap is actually reversed. Black women earn five percent more per hour than white women with the same AFQT score. 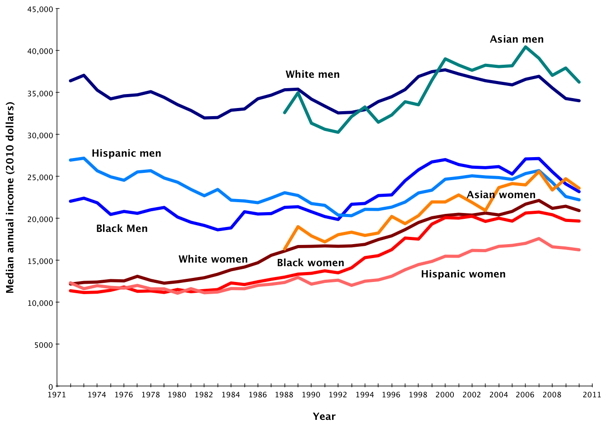 A criticism of the racial wage gap has been noted by a few scholars: the racial wage gap fails to account for the amount of people in a certain race that are unemployed. Examining median incomes does not reflect the growing racial disparity in joblessness. The Butler-Heckman hypothesis states that the least-skilled members of society are also the ones who are most likely to be not working, suggesting that the wage gap does not account for the overall difference in wages between races. An analysis of the black-white wage gap which accounted for unemployment found that when unemployment was included in the calculation of the weekly wages convergence from 1950 to 2000, the convergence percentage went from 13 percent to only 3 percent. So when you control for all these factors, the disparity deceases dramatically. So these ‘racist’ employers are favoring Asians, or perhaps a more plausible explanation is educational attainment and skills.